Nowadays it’s easy to become overwhelmed and lose our peace. However, God promises us peace no matter what is happening around us. People look for peace in many ways, but lasting peace comes only through Jesus Christ. Nowadays it seems easy to become overwhelmed and lose our peace. We only have to turn on the TV or pick up a newspaper to begin wondering what bad thing will happen next. However, in His Word, God promises us peace no matter what is happening on our jobs, in our homes, or in the world. People look for peace in many ways, but lasting peace comes only through Jesus Christ. 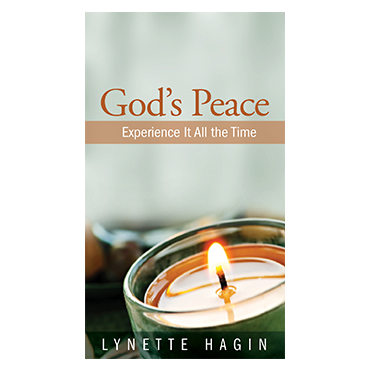 In God’s Peace: Experience It All the Time, Lynette Hagin shows us how to: • Keep our minds focused on the Giver of Peace • Never doubt the promises of God • Quit worrying, once and for all Anytime we are challenged, when we look to the Lord, He will deliver us and give us peace.